Here we go again, with another week of Gaming stuff. It's Easter today! What goes with Easter? Bunnies! Why? Because the Christian Church stole the holiday from pagans, who celebrated Easter (or Ostara; nobody really knows what it was called before the Christians got hold of it. All are merely guesses) as a fertility rite. Thus, symbols of new spring (like baby bunnies and newborn chicks) were common, and the Church just knicked those and said, "They're symbols of Christ's resurrection! Yeah, that's it!" So to tie in this week's gaming post with the bunny theme, I will discuss an idea that I worked on, briefly, with a friend of mine many years ago. The idea was "Anthropomorphics." We had originally intended it to be a GURPS sourcebook, but that idea never came to fruition. The idea was that you would play animals. There were three campaign styles: realistic, cinematic, and silly. Realistic is just that: you play an animal in a realistic manner. This campaign style is generally best suited for people who (out of some masochistic reason) want to play someone's pet. However, it can include things such as the Watership Down setting. That is, all the characters are playing one type of animal, living in a colony (a warren of rabbits, a pride of lions, a murder of crows, et c.). Alatimancy – This is one of three forms of divination involving salt. The first (alomancy) was detailed in the original post, and dealt with patterns in scattered salt. This variation is the reading of patterns formed in salt deposits left behind by the evaporation of salt water. It requires a special ceremonial bowl, and takes several hours (often a full day or more, if there is a large amount of water). The amount of water used depends on the nature of the question, as well as the level of detail desired. Prerequisites: 3 Water spells and 2 Earth spells. Anthracomancy – The observation of burning coal. Any coal will do, so long as the spell is properly enacted before igniting the coal. The spell requires at least an hour of observation. The answers to the caster's question are obtained by watching the movement of the coal and the behaviour of the fire as it burns. Prerequisites: 5 Fire spells and 3 Earth spells. Greetings again to you, my faithful readers! This week, I shall discuss the Lawsian Gamer Types. 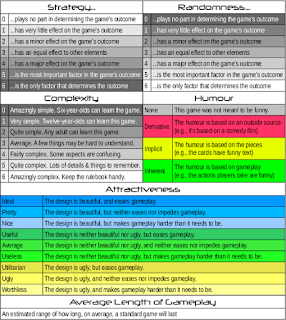 A prominent creator of gaming resources in the gaming industry, named Robin Laws, wrote an amazingly useful book called Robin's Laws of Good Game Mastering. Although this book is geared towards GMs, it has some very useful information for players as well. One example of these doubly-applicable tidbits is the idea that gaming is supposed to be fun. You know, that sounds pretty obvious, but the problem is that a lot of people forget that gaming is a collaborative effort, and work hard to have fun at the other players' expense. The book suggests that everyone involved work to have fun together as a team, rather than antagonistically. But that's not the topic of this week's rant. Today, I thought I'd talk about Gamer Types. 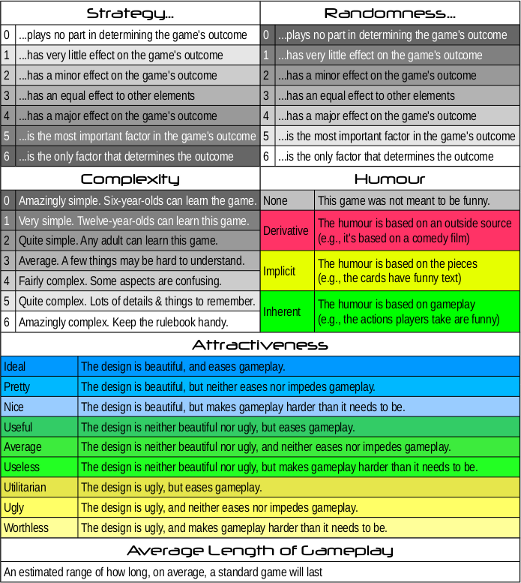 This was particularly useful for me, both as a GM and as a player. I'd struggled for years with the others in my gaming group, getting upset at them for ruining what I thought was an otherwise incredible game by insisting on doing nothing but killing the enemies for personal glory. It never occurred to me that different people play role-playing games for different reasons. And for that, I owe a debt to Robin Law. Welcome back! Time for another fun-filled episode of The Game Dork's Gaming Corner! It all started many many years ago. I had a friend, a very imaginative and creative friend, named John Trobare. John has a tendency to launch into some lengthy speeches, which are astoundingly funny and will have everyone in the area laughing uncontrollably for twenty minutes or more. Of particular noteworthiness was the time he described the adventure in which he and his friends Mike and Stephen went to Alaska in an attempt to make $30,000 each in a single summer aboard a fishing boat. But the instance that started this whole mess was when he described the species laevus ludorum, commonly known as the Game Dork. He described their habitats, behaviour, and mating habits. In particular, he devised the Game Dork Mating Call.